The Blood Flush C.D.C. Emerger has been very successful for a number or years. It is an emerger which, apart from the wing and thorax cover, sits under the surface with the orange in the wing giving the impression of a flush of blood. It is very good when used on a long leader, cast out to the rise and when fished speculatively on the dead drift. Thread : Wapsi U.T.C., colour to match the natural. Shuck : Grey pearl crystal hair. Detached abdomen : Singed micro or suede chenille, dependent on size, colour to match the natural. Thorax Cover/Wing : 2 CDC feathers, one orange and one natural. Thorax : Antron dubbing, colour to match the natural. Currently there are no comments about the Blood Flush C.D.C. 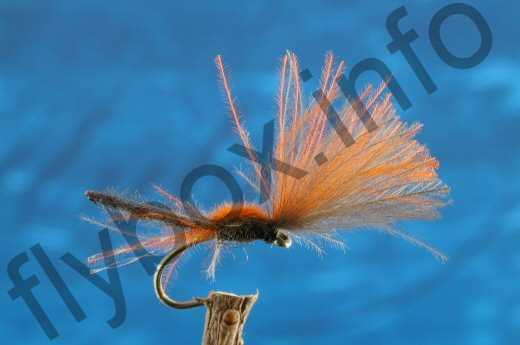 Emerger fly pattern from other fly fishermen yet.